Income from Other Sources covers income that does not fall under any of the other heads of income. Interest that gets accumulated in your savings bank account must be declared in your tax return under income from other sources. Do note that bank does not deduct TDS on savings bank interest. 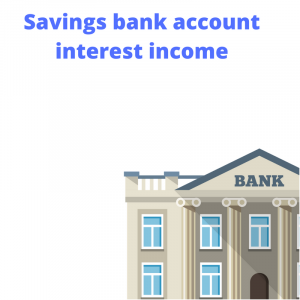 Interest from both fixed deposit and recurring deposits is taxable while interest from savings bank account and post office deposits are tax-deductible to a certain extent. But they are shown under income from other sources. Interest income from a savings bank account or a fixed deposit or from a post office savings account are all shown under this head. Senior citizens are not entitled to benefits under section 80TTA. Fixed deposit interest that you receive is added along with other income that you have such as salary or professional income, and you’ll have to pay tax on that income at a tax rate that’s applicable to you. TDS is deducted on interest income when it is earned, though it may not have been paid. Example: The bank will deduct TDS on interest accrued each year on a FD for 5 years. Therefore, it is advisable to pay your taxes on an annual basis instead of doing it only when the FD matures. Senior citizens, with effect from 1 April 2018, will enjoy an income tax exemption upto Rs 50,000 on the interest income they receive from fixed deposits with banks, post offices etc under Section 80TTB. Banks are required to deduct tax when interest income from deposits held in all the bank branches put together is more than Rs.40,000 in a year (Prior to FY 2019-20, it was Rs.10,000). A 10% TDS is deducted if PAN details are available. It is 20% if the bank does not have your PAN details. If your total income is below the taxable limit, you can avoid tax deduction on fixed deposits by submitting Form 15G and Form 15H to the bank requesting them not to deduct any TDS. Form 15G is for everybody else. These forms are for residents only and for those whose taxes add up to zero. These forms must be submitted at the start of the financial year. If you missed submitting them, then you can claim a refund by filing an income tax return. These forms are valid for one year only. Therefore, they must be submitted each year to keep banks from deducting tax. If you have three FDs open, then add up all the interest income and enter it under ‘Other interest income’. Starting June 2015, when interest income from all the branches of the bank including from recurring deposits, exceeds Rs.10,000 in a financial year, a 10% tax on interest earned will be deducted. The interest earned should be shown in ‘income from other sources. The PPF and EPF amount you withdraw after maturity is exempt from tax and must be declared as exempt income from income from other sources. Note that: The EPF is only tax exempt after five years of continuous service. Read in detail the rules of EPF withdrawal and taxability thereof. If you are collecting pension on behalf of someone who is deceased, then you must show this income under income from other sources. There is a deduction of Rs 15,000 or one-third of the family pension received whichever is lower from the Family Pension Income. This will be added to the taxpayer’s income and tax must be paid at the tax rate that is applicable. I have received dividend from an Indian company this year. Is this taxable as income from other sources? No. Please note that dividend income received from an Indian company is exempt under Section 10(34) of the Income-tax Act, 1961 and need not be shown under “other sources” as income but must be shown under “Exempt income” in your tax return. What is the tax treatment of dividend received from a foreign company. Only dividend received from an Indian company is exempt from income tax in India. Dividend received from a foreign company is taxable as “Income from other sources” and you need to pay taxes at rates based on the income slab you fall under. Is dividend received from mutual funds taxable? Dividend received from mutual funds is also exempt from income tax under Section 10(35) of the Income-tax Act, 1961. I have received prize money worth Rs 2 lakhs by participating in a game show. Is this taxable? Yes. Prize money received from participating in game shows in taxable as income from other sources. Generally, taxes at source would be deducted on such sum at the time of payment to you itself at the rate of 30%. Even if taxes have not been deducted, you may pay taxes on such income based on rates applicable to the income slab you fall under. I have interest income from a fixed deposit, a recurring deposit and a savings account. What is the taxability? Do I have an deductions available on such income? All such interest income is taxable under “Other sources”. You will be liable to tax based on your income slab. Further, you enjoy a deduction upto Rs 10,000 on interest received from savings account and recurring deposits. While senior citizens get a deduction upto Rs 50,000 on their interest income from fixed deposits. On the occasion of my marriage, I received Rs 1 lakh in cash from my father. Will this sum be taxed? Money received from a “relative” is not taxable under the Indian tax laws. Further “relative” includes father. Therefore, you will not be taxed on this sum you have received. Can I deduct expenses from ‘income from other sources’? Yes, you can deduct expenses directly related to getting that income. The tax-saving FDs come with a lock-in of 5 years. The amount you invest can also be claimed as deduction under Section 80C subject to a maximum limit of Rs.1,50,000. But like a regular FD, the interest is fully taxable. I earn income solely from fixed deposits. Do I have to file an income tax return? Any individual whose income exceeds Rs.2,50,000 during a financial year must file an income tax return in India. If the bank has deducted TDS and your income does not exceed Rs.2,50,000, then you must file a tax return to claim a refund on excess TDS deducted. In this article, we discuss tax filing for Security Traders. This article will help you with taxation of unexplained cash credit and cash transactions limits. Know about gift tax, how are gifts taxed and when are gifts exempted from income tax. Find out how tax is treated on different types of gifts received. Interest income from Fixed Deposits is fully taxable. Read to know more about how to calculate tax on interest income,when to pay tax, Understanding TDS in relation to FDs & FD for senior citizens.